Mouth Ulcers or Aphthous ulcers are painful sores which each and every person might have experienced at some stage in their life. These ulcers are absolutely harmless and most of the time they subside without any treatment. 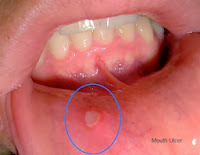 Usually these ulcers occur inside of the lips and cheeks, tongue and gums. They normally subside within 2 weeks. It is always advisable to see a doctor if the ulcers persist for more than 3 weeks, increasing in size and is getting more painful. It could be a cause of underlying disease. Most of the time, the ulcers subside without any treatment. Some simple home remedies will help most of the time. Try gargling with a mixture of warm water and salt. Avoid eating hard and spicy foods which can aggravate pain. But if they are really disturbing your daily routine then you should definitely seek a dentist’s help. Your dentist might prescribe you a topical protective gel to apply on the ulcer or a topical mouthwash. If still the ulcers do not subside, your dentist might prescribe a topical medication containing steroid to reduce the inflammation.